1. Make the crust: Combine pecans and sugar in food processor and process until finely ground. Add flour and process to combine. Add butter and pulse until pea-size crumbles form. Add egg yolk and ¼ cup ice-cold water and pulse just until combined. Transfer to counter and knead into a disk. Wrap in plastic wrap and refrigerate for 1 hour. Heat oven to 375°. On a floured work surface, roll dough until⅛" thick. Line a 9" pie plate with dough, and prick with the tines of a fork over the bottom; bake until golden brown, about 20 minutes, and then let cool completely. 2. Make the pecans: Whisk egg white in a medium bowl until frothy and loose; add pecans and sugar and toss until evenly coated. Transfer to a parchment paper- lined baking sheet in an even layer, and bake until lightly toasted and dry, about 10 minutes. Let cool completely. 3. Make the ice cream: Whisk together sugar, yolks, and vanilla bean and seeds in a4-qt. saucepan; stir in milk, and whisk until smooth. Place over medium heat, and cook, stirring often, until thickened and mixture coats the back of a spoon. Pour through a fine strainer into a bowl and stir in cream and vanilla extract. Let cool and then refrigerate until chilled. Process in an ice cream maker according to the manufacturer's instructions. 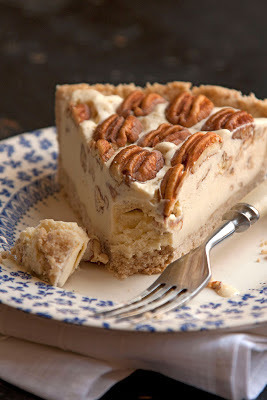 Once churned, stir pecans into ice cream, and then transfer ice cream to pie crust, smoothing the top with a rubber spatula. Decorate with more whole pecans, and freeze until set, at least 4 hours.